Liam Barrington-Bush is exploring new forms of political action and organization, from Mexico to the UK. His book, “Anarchists in the Boardroom” is out soon. I met him at the Left Forum in New York City a few weeks ago, where he had invited me to a panel on horizontal forms of organization. This led to this interview in today’s Guardian, which I am also pasting below, with apologies to The Guardian’s copyright guardians (all property, including intellectual, is theft!). The Occupy Wall Street activist and London native explains what ‘gentle anarchism’ could do for voluntary sector organisations. Carne Ross says ‘gentle anarchism’ is a work in progress. 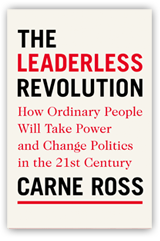 Carne Ross is not the kind of person that comes to mind when most people think of anarchism. The New York-based, south London native is generally found in a suit and tie, with early hints of grey offering the air of maturity one might expect from a career diplomat. Yet Ross has named his political outlook a gentle anarchism. “Anarchism is […] about shared decisions about things that affect us, where everyone with a stake gets a say,” Ross said, following a panel he spoke on at Left Forum in New York. The panel aimed to address whether charities and trade unions make the transition to horizontalism, a reference to the broadly-anarchistic organising practices used at Occupy camps and within other social movements around the globe in recent years. 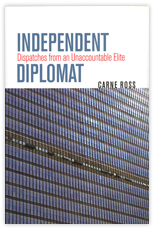 Ross made headlines by stepping-down as Tony Blair’s Iraq expert at the UN in 2004, over the country’s decision to go to war, going on to set up the world’s first nonprofit diplomatic consultancy, Independent Diplomat. He is also a member of Occupy Wall Street (OWS). “[Occupy] has shifted from a protest phase to an action phase,” Ross says, rebutting claims of the movement’s death. “Occupy Sandy was the most effective voluntary response to help the disaster victims.” It beat the Federal Emergency Management Agency (FEMA) and the Red Cross into many of the city’s hardest hit neighbourhoods, and was there long after these older institutions had left. Where can voluntary organisations fill a gap left by the state or private sector and challenge the political conditions which have created that gap? In regards to so many organisational attempts to influence government, Ross feels “protest is very limited in effect”. He explains that “power is resistant to complaint and is extremely skilled at pretending it cares,” pointing out that even the Chinese government offers their own citizen-generated petition website, but which has done little to fill the country’s vast democratic deficit. But protest and advocacy are bedrocks of civil society – what has Occupy done differently? Tammy Shapiro, an Occupy Sandy organiser speaking at another Left Forum panel, described “services as a starting point for radical organising,” explicitly linking disaster relief efforts with the issues of structural racism, poverty and urban neglect that made Hurricane Sandy so much worse for some, than for others. Working with affected communities as equals during moments of extreme crisis, organisers built up relationships in hard-hit neighbourhoods at the height of the storm, well before the official relief agencies were on the scene. This helped open doors to collaborative longer-term community building efforts, such as coop incubation, community childcare initiatives and guerrilla gardening, where communities reclaimed public green spaces to plant vegetables and provide healthy, cheap and local food options in the heart of various affected communities. Their efforts were shaped by on-the ground situations, whether in the Rockaways, Sheepshead Bay, or Staten Island, responding, as Shapiro described, “in ways that fit the group that they had, fit their skills and fit their interests,” rather than applying a pre-meditated strategy or blueprint, as has been a hallmark of so many traditional relief efforts. Could charities devolve greater decision making power to a local level, allowing people to shape their own responses? Ross sees two fundamental points where meaningful change can begin to emerge, organisationally and beyond. “I believe that we have to build new and better systems, methods of working and institutions. Our systems must reflect our fundamental political values,” he says. So what might it mean for a charity to show and not tell? OWS projects have shone some light on potential examples, aiming to create alternatives to various failing mainstream institutions, from relief agencies to banks, while ensuring that these new structures are practical reflections of the values they operate from. Doing so means decisions are made through group consensus, power is evenly distributed among participants and individual autonomy is respected, with Occupiers free to find their own ways of supporting a cause, rather than being slotted into a premade volunteer opportunity or job description. Can voluntary sector organisations take on similar processes? Organisationally, this might mean an overhaul of management structure (several charities, such as People & Planet and the Otesha Project, have eschewed a single chief executive or director, in favour of a flatter, more collaborative executive), or a democratic cooperative ownership model, in which all employees have equal say in a range of organisational decisions. It could also affect the ways projects are organised, with less emphasis on permanent teams, and more on ad-hoc collaboration across departments, based on individual skills and enthusiasm for a particular project. But there’s also a more personal element to the kind of change Ross advocates. “If the passions [of staff and supporters] are truly engaged, people become incredibly powerful; momentous change becomes possible.” Unfortunately though, he adds: “most organisations contrive to destroy the passions that inspired people to join them and the more hierarchical they are, the more demoralised is the staff”. How does an organisation invested in a top-down way of doing things begin to offer those within and around it a true sense of agency to shape the organisation’s work and direction? “Just ask them what they want,” Ross states emphatically, while adding the critical disclaimer that it only works when you listen to (and take steps to implement) their answers. Liam Barrington-Bush is an activist, social change consultant and author of the upcoming book Anarchists in the Boardroom: How social media and social movements can help your organisation to be more like people, due out in September 2013. He Tweets as @hackofalltrades.